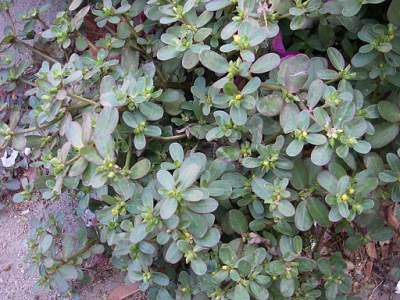 Purslane (Portulaca oleracea) medicinal herb is a traditional plant that is very popular in Jamaica. It is native to various regions of Europe, but it can be found all over the world, including the West Indies, Japan as well as China. It is not only known for medicinal purposes, but it is observed as an edible herb because the stem and leaves may be used as salad and eaten as vegetable. It can also be used in soups as well as stews. It is just a pity that many persons only see it as a weed. The entire medicinal plant can be used for medicinal purposes, inclusive of the seeds. A proof of its existence is found in Job chapter 9 verse 9 of the Bible. This tells us of its traditional history. It is from the Portulacaceae family and the medicinal properties are diuretic, antioxidants, anti-inflammatory, anti-hemorrhagic and antimutagenic. The common names are Portulaca oleracea, Little Pigweed, Hogweed, Verdolaga, Moss rose, Pursly, Green pursly and Red root. Some of its constituents are vitamins A, B, C and E, Omega-3 fatty acids, carotenoids, potassium, magnesium, calcium and iron. It also contains betalain alkaloid pigments and alpha-linolenic acid. Although it is discovered that the leaves have oxalate which is contributory to the formation of kidney stones, cooking this herb will significantly reduce the oxalate. Its health benefits include treatment of heart ailments as well as bladder conditions. It is an excellent remedy for scurvy, dry coughs, aches and pains. It can also alleviate heavy bleeding. The crushed leaves can be placed on the forehead to alleviate headache. The crushed leaves can be kept in place by using a cotton material to tie around the head. This application can also reduce body heat. Culpepper had a few words for this precious herb. He said, "the herb placed under the tongue assuayeth thirst. Applied to the gout, it easeth pains thereof, and help the hardness of the sinews, if it come not of the cramp, or a cold cause." A wise man he was when it comes to herbs. In regards to persons who do not wish to consume it in the traditional ways, then you may try the purslane juice which contains all of its health benefits.